English-Russian Talking Travel Phrasebook for. The intelligent talking solution for portable communication that features more than 14,000 phrases for all common situations. 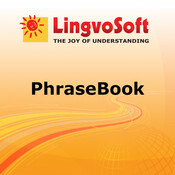 LingvoSoft Talking PhraseBook English - Russian for iPhone provides instant bi-directional translation of thousands of practical and useful phrases. It replaces bulky and inconvenient books and speaks all of its phrases aloud using clear, understandable native speaker voice narration for both languages. With it you will always be understood - even if you can't speak a word of another language. Key features include authentic human voice narration, 15 easily navigated topic-areas, a choice of six display languages and advanced speech recognition for hands-free navigation. Topic Areas Everyday Conversation, Traveling, Local transport, Driving, Hotel, Restaurant, Shopping, Post Office, Telephone, Bank, Sightseeing, Health, Beauty salon, Sport, Housekeeper LingvoSoft Talking PhraseBook features: Linguistic 14,000 indispensable phrases in 15 topic areas with several options per phrase Interface Authentic native-speaker voice narration of all phrases Advanced Speech Recognition for navigation and learning game Customizable interface with choice of display language and installation options Quick search by first letters of key words Superior keyboard layout for better language specific character input The ‘All topics’ section displays every single phrase contained in the PhraseBook.